The Gate Crafters Outdoor Buried Driveway Exit Sensor is compatible with: All gate openers. The Gate Crafters sensor is a multipurpose exit sensor and vehicle detector that allows hands free access; and, because of its simple design, it is compatible with most gate openers including the Estate Swing, Apollo, Zareba, and many others. The single piece design provides the installer with simple installation procedure. The Gate Crafters Exit Sensor is buried in the ground so a potential intruder or vandals do not notice it. 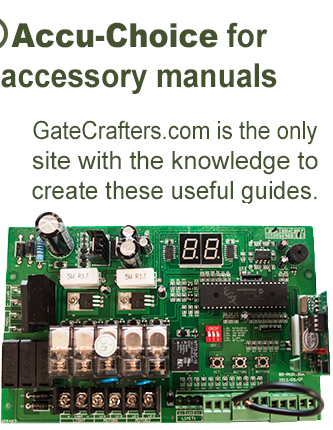 The Gate Crafters has wide range power supply options from 9V to 35V AC or DC. Low current consumption makes it an excellent choice for solar power applications. The Gate Crafters sensor uses passive probe sensor to detect changes in the earth's magnetic field. These changes are caused by a movement of ferrous metal objects such as a car in the proximity of the probe. The sensing area of each probe is in the shape of about 15-foot circle. The size of this detection circle changes with the size and speed of the moving car. The Gate Crafters sensor can be buried in the ground about 6 inches deep parallel to the paved driveway. It also can be placed 2 inches deep in asphalt or concrete under the path of the vehicle. Note: Exit wands / sensors should not be used on properties in which the driveway gate is designed to keep in pets, children or live stock due to possibility for unintentional openings. Our suggestion is to use a keypad for exiting so the gate will only open when it is intended to by code. 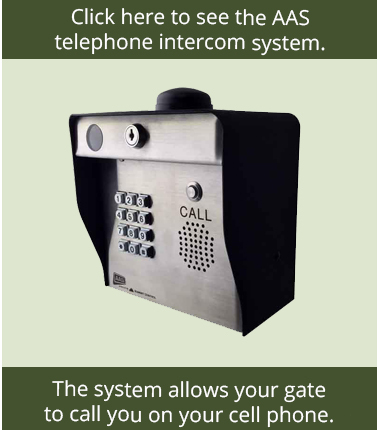 Access Control: Can be used as a free exit vehicle detector for gates, overhead doors and parking barriers. Safety: Can be used to detect moving vehicles in an environment where there are blind areas along the driving path and actuates warning lights. Energy Conservation: Can be used to detect moving vehicles along a driving path or driveway and turn lights on only in the proximity of the vehicle. Security: Can be used to detect approaching vehicles or an unauthorized movement of a parked vehicle and actuate alarms, video cameras or vehicle annunciator. 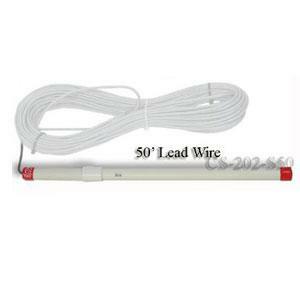 The exit wand is available with the following amount of lead wire. You may not extend the wire. Choose your desired option above. 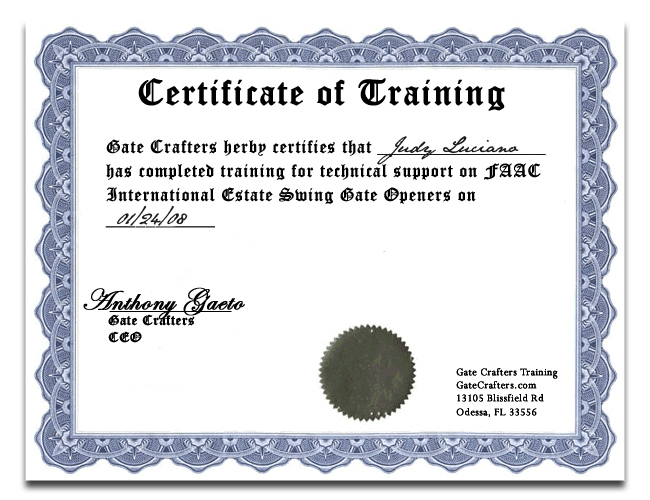 “We are always getting questions about how gate exit wands work and how they are different from exit loops. Exit wands are what is know as a magnetometer which senses changes in the Earth’s magnetic field. An easy way to explain how exit wands work is to picture a boat traveling through the water. As the boat is traveling it is creating waves. As your car travels through the magnetic field of the Earth it creates similar waves, like the boat. The exit wand’s magnetometer picks up on these waves as you travel by the wand. One downside of exit wands is that they do loose sight of your vehicle when it is stopped. Gate Crafters carries 5 different types of exit wands that work very similar to each other. The only difference between these wands are some of their features. The GTO/PRO wireless exit wand is wireless between the magnetometer and receiver . The Gate Crafters exit wand is manufactured by EMX and has been around for years. The GTO exit wand is recommend for use with other GTO openers and accessories. The Estate Swing exit wand does come with a range control board that allow you to adjust the sensitivity of the magnetometer. 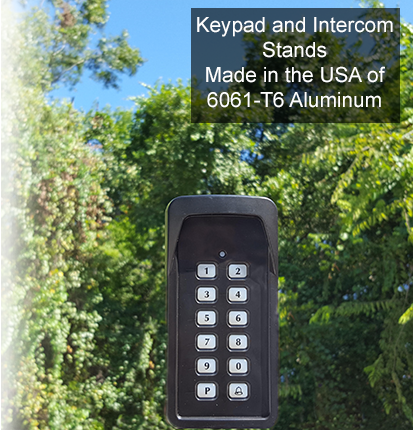 This feature allows you tune down the range of the exit wand, so that vehicles such as a lawn mower doesn’t set open your gate, but this isn’t a complete failsafe, as it will still operate the gate opener when something is nearby. The Estate Swing Deluxe Exit wand is the most different from the other exit wands. It is constructed out of copper and features a ground cable that attach to a grounding rod that helps protect this exit wand from lightning strikes. The other 4 exit wands do not have this feature and are susceptible to damage from lightning strikes. Also the Estate Swing Deluxe Exit Wand comes with a 5 year warranty, which is longer than any other exit wand we sell. Exit loops differ from exit wands in that they are buried in the driveway in a loop and are wire to the gate opener. The way exit loops work is that they detect the presence of metal (your car) above the loop. It does not matter if your car is moving or not, the loop will detect the car. Besides being used to exit your property, exit loops are used for safety. When exit loops are used a safety device, they will prevent your gate from closing on your car, when it detect a car nearby to your gate. The exit loop is wired to a exit loop detector, which is then wired into your gate opener’s control board. GateCrafters.com is a one stop shop for gate openers and gate accessories at a great price. Gate Crafters was started on the idea of providing gate opener and accessories along with great customer service to our valued customers. We have technical support available to you 7 days a week from 9 am to 9 pm, eastern time. Our experts are standing by to take your phone call, answer your email, or chat with you with our live chat on our website. We welcome any question you may have and can help you put together a complete package for you so your gate operates how you want it to. We look forward to hearing from you.